This post follows part 1 and is continued in part 3. AFTER A FORTNIGHT IN THE RANGES.— The four trampers who have been travelling through the Tararua Ranges since Easter Saturday, having been delayed by bad weather and swollen rivers. From left, Mr. A. H. O’Keefe, Miss M. Williams, Dr. W. B. Sutch, and Mr. E. Hill. On the 30th of April, 1933, a large group on a Sunday walk, from a recently formed Carterton Tramping Club, happened to look over the Waiohine River. They spotted a party of four trampers on the far side, trying and failing to wade across. The group was soon recognised as the four missing people who had left Te Matawai Hut more than two weeks before. Once they’d made their way to the nearby cable-way and been ferried across, they were quickly fed and given warm cups of tea. The story of the group’s plight was finally known. Bert O’Keefe had slipped whilst sidling the Broken Axe Pinnacles, after wind prevented them from going over. He fell about 40 feet, dragging Eric Hill with him as he fell. Mr Hill was protected when he fell onto his pack, but Mr O’Keefe sustained a gash to his face and was unconscious for about an hour. From then on he wore a balaclava perpetually, to protect the wound. Despite this injury, the unforeseen problem brewing was the loss of time. With two fewer hours of daylight, they were unable to reach Holdsworth before dark, and had to camp on the bush-line. They had expected they might need to camp somewhere for a night, but the weather then deteriorated severely, bringing snow and biting winds to the tops that would prevent them from accessing what were typically referred to as trampers’ highways of the time. Their situation became serious, especially when the weather lasted for the better part of two weeks. Having left with about two days of food between them and anticipated no more than a single night out, they were faced with miserable and extremely slow travel, attempting to escape through land below the bush-line that was not well known and (at the time) barely tracked at all. The party had initially tried to follow the Waiohine River, not realising that it would be a nightmare of gorges and very slow travel. During this time, a massive land search and rescue operation was occurring all over the range, which they realised when an aeroplane flew overhead, but they were unable to attract its attention. Despite the extent of the search, they were not found before they’d managed to walk out of the range on their own. Bert O’Keefe was by far in the worst condition. Besides the gash to his face, he also developed bad frostbite to the extent of needing to spend ninety minutes each morning simply to put on his boots. His condition played a significant part in their eventual decision to risk trying to walk down the river rather than risk returning to the icy and exposed conditions on the tops. They followed the Waiohine River for some distance, but eventually found it too gorgey and impossible to continue. When the river levels rose too much with the rain, and finding themselves completely trapped by the flooded Waiohine and Waiohine-iti rivers*, they’d spent several days trying to get up towards Hector on the Tararuas’ Main Range. They were turned back by dangerous weather, and not helped by the state they were in. Eventually getting around the Waiohine-iti, the group returned to the Waiohine and spent the next week climbing and sidling around cliff faces and bush above the river. If their map hadn’t had an edge in an unfortunate place, they might have noticed they were nearly within shouting distance of Sayers’ Hut** when they walked through Totara Flats. The hut was almost certainly full of searchers with a fire going at the time, but any smoke lifting from behind the trees was obscured by the weather. Instead they continued sheltering in ad-hoc camp-sites under logs, barely being able to start a fire in the conditions, and slowly inching their way along a mostly untravelled Waiohine River. The media leaped on the group and pestered them for details when they walked out, including Bert O’Keefe when he was en-route to hospital to treat his frostbite. Monday’s newspapers included large sections describing the plight of the party, but also included hastily made comments that would be perceived as arrogant, and not appreciative of the tremendous search effort that had been mounted by volunteers. The search effort over the past week had received substantial monetary donations from the public, and been heavily promoted by the press. For now, however, they were out. FOUND IN THE TARARUAS.— Members of the Carterton Tramping Club with the four missing trampers who were located yesterday on the Carterton side of the Tararua Range. Great relief was felt throughout the community yesterday afternoon when the news quickly spread that the trampers who had been missing since Easter Saturday—just over a fortnight—had been found. The four trampers—Miss M. Williams, of Wanganui; Dr. W. B. Sutch, of Palmerston North; Mr. E. Hill, of Aokautere; and Mr. A. H. O’Keefe, of Wellington—were met at midday in the Waiohine Gorge, about twelve miles from Carterton, by a party belonging to the Carterton Tramping Club. They were then making their way out of the bush. Mr. O’Keefe was suffering from frostbite and the effects of a head injury, and all were weak from exposure and lack of food during the previous four days. They stated that they had been held up by bad weather, and had not been lost at any time. In an interview with a “Post” representative Mr. E. Hill, the leader of the tramping party, gave a graphic description of the hardships and perils experienced by the party. Their efforts at times had to be almost superhuman in order to overcome obstacles which at times threatened to bar all progress and necessitated perilous rock climbing of hours’ duration which ended in the progress of only a few yards. Mr. Hill stated that at no time were they lost. They had their map and knew that they were following down the Waiohine, but had no conception of the difficulties that they would meet in trying to find a way out. “We left Te Matawai hut about 4 o’clock on the morning of Saturday, April 15,” said Mr. Hill, “and,by 3 o’clock in the afternoon had got as far as Broken Axes. It was there that O’Keefe slipped, and in an endeavour to save himself pushed into me and we both went down about forty feet. When I found my legs, I looked round for O’Keefe, and asked him how he was, and found that his face was covered with blood. He had an ugly gash on his forehead and others on the chin and nose. We plastered them up with sticking plaster and I gave him my balaclava, which he wore until the end. For a week later he had a beautiful ‘bung eye’ as well. UP AND DOWN SHEER CLIFFS. “It was this accident that was the initial cause of our misfortune. We reckoned we had left Te Matawai in sufficient time to get to Mount Holdsworth hut before it was dark. When O’Keefe got hurt we were delayed two hours until he found his feet again, and it was this two hours that we needed when darkness descended, and we were compelled to go down to the bush to bivouac. The fog was thick, but we had carried on through it. Next day we dropped down to the Waiohine with the intention of following it down, and to our surprise found that it ran through precipitous gorges, with a sheer face of 200 feet and only a few feet wide. However, by hanging on to the overgrowth we managed to get down, but did not get out of this gorge until midday on Monday. There were few shingle beaches which were not more than a few yards long at the best of times. We waded down, sometimes up to our armpits, till Thursday, covering a distance of six or seven miles. The going seemed so impossible that I thought that if we climbed back again to the top of the main range, south of Crawford, we might get on to the Hector track. We got to a height of about 2000 feet, where we had to spend three nights and two days under the roots of a fallen tree, the only additional shelter being my sleeping bag, which I cut and spread out as a lean-to. Those three nights were very miserable and dirty. It was at this stage that my faith in the law of averages sadly failed me. I had reckoned that we could anticipate at least one day fine after six had been wet, but instead of that it got worse. “Then we went up to about 3300 feet, camped for the night, and then it snowed. We couldn’t light a fire, because everything was sodden and wet. We stayed there Sunday night and had to wait till Monday before we could get higher. However, we found the snow near the top was two feet deep, and it would be absolute suicide for us to try to get over to the Hector track in the condition we were. O’Keefe’s feet were black, and my own feet were like walking on my ankles as a result of the cold. Had we tried to camp one night in the snow, we would never have lasted it out. “We were trapped between snow and the flooded river below. “We dropped back to the river reluctantly, but further downstream, near where.the Waiohine-iti joins up with the Waiohine. “On the Wednesday we heard an aeroplane go over, but did not see it. I immediately started a fire in some dry birch, but by the time the smoke got above the bush it had been dispersed. That was the only time an aeroplane was heard; the continual roar of the river through the gorges blotted out all other sound. “Eventually,” said Mr. Hill, “we reached Totara Flats, which is in the nature of a plateau some 300 acres in extent right in the middle of the ranges. There was a herd of steers there grazing, and we thought we were not far from civilisation. However, we were doomed to disappointment, for after following the stream across these flats we discovered that it disappeared into a gorge similar to those we had just come through. Our jubilation, as you can imagine, when we left camp on the Flats on Saturday morning, was short-lived. We had to encounter the same difficulties in this gorge until we eventually struck a cleared ridge, which indicated that we were in settled country. The slopes were covered with wild growth. It was tough going and in our weakened condition it was beginning to tell on us. At Totara Flats we saw footprints in the sand and thought probably they had been left by searchers who had gone over that part of the country a few hours ahead of us. “It was while we were struggling through, the keke that I heard a voice, and I tell you it was heaven to hear it. It came from a man on the other side of the stream, who asked me if I knew where the Cradle was. He evidently thought I was a deer-stalker, but on second thoughts he asked me if I was one of the missing trampers. I told him I was, and he rushed back to a party of members of the Carterton Tramping Club—mostly girls —who were hiking up the valley. We gave them a good exhibition of rock climbing as we came down the keke-covered slope of the river,” Mr. Hill added facetiously, “and they seemed to be scared that we might fall in the last lap of our journey. Regarding the report that they had left food for a subsequent trip across when the snow was on the ground, it had been their intention to do so at Holdsworth, but they never got that far. They had all the rations that they took with them from Te Matawai hut. The four trampers, Miss Williams, of Wanganui, and Messrs. Hill, of Palmerston North, and O’Keefe, of Wellington, and Dr. Sutch, of Palmerston North, who have been missing in the Tararuas for nearly a fortnight, were discovered about noon yesterday making their way down the Waiohine River, near Greytown. Although bearing unmistakable signs of the ordeal through which they had passed, they had withstood their severe gruelling remarkably well, considering the rigorous weather and the exceedingly rough country through, which they had passed. They were found by members of the Carterton Tramping Club, a newly-formed body, who went up the Waiohine River for a day’s outing. The first sign of the party was seen at a place called “The Cradle,” about three miles past the end of the Waiohine Valley Road, where there are few settlers, on the lower reaches of the river. The Carterton trampers were having tea when they saw the missing party crawling across the rocky side of the river. “We were afraid they would fall into the river,” said one of the eye-witnesses. “As soon as it was realised that they were the long-lost trampers, everything was done to assist them, and in a few minutes they were refreshed with hot tea and eatables. The party was then conducted to Mr. Compton’s residence, the nearest place in the valley. There they were treated with, the greatest kindness and’ provided with comforts in the way of warm clothing and a square meal, the first they had had for two weeks. Word was at once sent to the Carterton police, and other helpers proceeded to render any necessary assistance. After a fortnight spent in the open in some of the roughest weather experienced for years, all the members of the party looked far better than could have been expected. Miss Williams presented a rather pathetic appearance, pale and hollow-eyed, but she still seemed to have some spirit and energy. The men showed remarkable spirit, and although they had had little sleep and were about exhausted, all of the members of the party readily conversed with pressmen on their arrival at Carterton at 4 p.m. As soon as they arrived there arrangements were made to convey them to their homes, O’Keefe going to Wellington by car and the others to Palmerston North, also by private car. Before leaving Carterton, the party was photographed in the police station yard. The members of the party had a thrilling story to tell of their experiences, and how they were trapped by flooded river and snow. At no time were they really lost. Leaving the Te Matawai hut at 3 a.m. on April 15, with the intention of traversing the Mitre and the Mount Holdsworth Ridge and reaching Mount Holdsworth hut the same evening, the party made good progress as far as the Broken Axe pinnacles, about three hours’ tramp from their objective, where O ‘Keefe and Hill slipped and fell twenty or thirty feet. O’Keefe suffered a severe cut on the head, and was laid out for about an hour, and Hill was badly bruised. During this time an approaching storm rendered the conditions unpleasant, the mist getting worse and the wind stronger. Then darkness came on. When O’Keefe came round he was pretty groggy, and the other members had to take some of his pack. The wind, which had slowed the pace of the trampers near the Pinnacles, increased, and the party decided to spend the night at the bush line. The next day the weather conditions became impossible, and they found they could not get back to the top, so they decided to carry on down the river, quite prepared to wade. They proceeded to the junction of the Waiohineatea and Waiohine Rivers, where they found further progress impossible, the river being shut in by cliffs. Then the river rose, and the party decided to take the high country in an endeavour to reach Mount Hector and strike the Greytown-Otaki track. It took them two days to reach the top of the ridge, and then snow blocked further progress. In the effort to reach the main range, the party spent three days in the snow trying to reach Mount Hector, but had to give it up. It was here that they suffered great privations, with frozen feet. It took them over an hour to warm their hands, and O’Keefe of for five days had his feet black from the ankle down. It took him an hour and a half to put his boots on. Beaten by the snow, the party had no alternative but to return to the river and make a way down as best they could. It was thus that they were discovered, with no food left. When they set out the party had food for two days, but when they found that their predicament was bad, rationing was instituted, and for the last five days they had had no food, only tea. So low did the rations fall that at one stage they had half a teaspoonful of jam a day. The last solid food was one ounce of bully beef five days ago, and previous to that alternate spoonfuls of jam and dried skim milk with water. All the members of the party except Dr. Sutch had sleeping bags, Dr. Sutch having blankets only. Hill and O’Keefe had blankets as well as bags. On the first night out, Hill cut up his sleeping bag to make a rough shelter, and throughout the journey the party had wet blankets and clothing. “We realised that we were trapped and could not get across the Waiohine River to Holdsworth, and then the snow came on and we could not get across to Hector,” said Mr. Hill, leader of the party. “We heard an aeroplane when in the Waiohine, and lit a fire. “The bush sense of Miss Williams was a great factor in our getting out. In the last few days we tried the most reasonable thing,” he said, referring to movements of the party. The feelings of the twenty-six members of the Carterton Tramping Club who found the missing party were described to a “Post” reporter last evening. 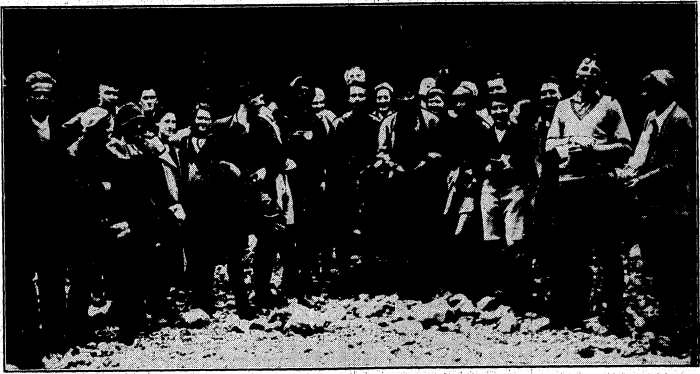 The Carterton Club members were on their usual weekly tramp, and had intended to go up the Waiohine Gorge. They came out about one hundred yards above what is known as “the cradle.” a seating arrangement for two, suspended on a cable above the river. Down below on the opposite bank of the river they saw four people making their way upstream and looking for a place to cross. As the Carterton trampers watched, uncertain whether the smaller party was the missing one, they saw the four people attempt to wade the river. It was too deep, however, and the four retraced their steps in the direction of the cradle. The noise of the river at first made it impossible for the calls of the Carterton party to be heard by the others, but eventually they looked up and answered. Then the cradle was taken across, and they were brought over to the other bank. A fire was quickly lighted, and the four weary trampers were provided with hot drinks and food. It was just after noon when the missing trampers were found, and after they had been given a meal they were assisted to Mr. W. Compton’s farm, Miss Williams, Dr. Sutch, and Mr. O’Keefe making the trip on a horse, while Mr. Hill walked with the Carterton party. They were then taken on to Carterton, where a large crowd had gathered, the welcome news having been telephoned ahead. Mr. O’Keefe was brought back to Wellington by car, and the other three proceeded to Masterton and later to Palmerston North. Asked if they had left any indication of their route for the benefit of possible search parties, Mr. O’Keefe said that they had not deliberately left signs, but their camp sites would have been as good a guide as anything else. Mr. O’Keefe said that he wanted to emphasise the point that they were on their way out when they came across the Carterton trampers. They were only one and a half miles from Mr. W. Compton’s homestead, and he thought they could have walked the distance without a great deal of difficulty. * Historic naming as used in these articles is different from current naming. What is currently referred to as the “Hector River”, which flows into the main Waiohine River, used to be considered as the main head-waters of the Waiohine River. The part of the Waiohine River prior to it joining those other headwaters was referred to as the “Waiohine-iti”. The hut that we know (built in 1909) has always been on the east side of the river. In 1948 it was moved back from the river to its present site. River erosion soon afterwards obliterated the original site. Leo Sayer (1903-1984) built ‘Leo’s Whare’ on the west bank as a base for possum trapping. As far as I can tell, this was in a clump of totaras below where NZFS built the second Totara Flats Hut in 1973. It had three bunks, a dirt floor and a tree incorporated in one wall. I don’t have exact dates for it, but Leo probably built it in the 1920s. A falling tree demolished it in the 1940s after the Sayer family had relinquished their grazing lease. 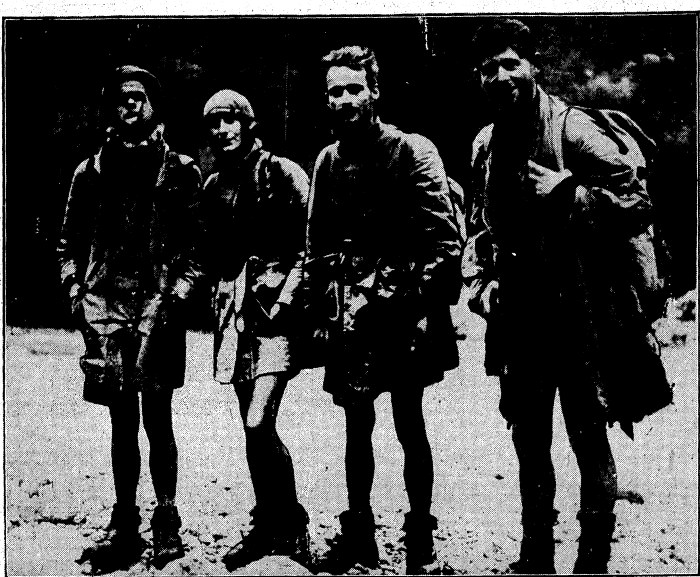 This entry was posted in article and tagged article, change of plans, history, newspaper clippings, search and rescue, snow, tararuas, tramping. Bookmark the permalink. I’ve just made a small, but very significant correction to my comments in this article, having just stumbled on the information that Sayers Hut actually used to be on the west bank of the Waiohine River, before it was disassembled and carried over the river in about 1947 or 1948. Until now I’d assumed Sayers Hut would have been on the far side of a flooded and very noisy river, which would have meant it unlikely they’d realise it was there without prior knowledge. Being on the western side, however, means that the party of 4 must have virtually walked past the doorstep of Sayers Hut without realising just how close they were, and that it was most likely filled with rescuers-in-waiting. On this, I’ve been contacted by John Rhodes with a suggestion that the linked quotation, about Sayers having then been on the west bank of the Waiohine, may be incorrect, and that it was always on the Eastern bank but was merely shifted further away in the 1940s. This would seem consistent with Fred Vosseler’s comment in the context of the search, that the hut was easy to locate “even from the opposite side of the river”. Can anyone confirm the hut’s location for certain? “The hut that we know (built in 1909) has always been on the east side of the river. In 1948 it was moved back from the river to its present site. River erosion soon afterwards obliterated the original site. “Leo Sayer (1903-1984) built ‘Leo’s Whare’ on the west bank as a base for possum trapping. As far as I can tell, this was in a clump of totaras below where NZFS built the second Totara Flats Hut in 1973. It had three bunks, a dirt floor and a tree incorporated in one wall. I don’t have exact dates for it, but Leo probably built it in the 1920s. A falling tree demolished it in the 1940s after the Sayer family had relinquished their grazing lease. That does seem wierd. If I had to take a guess I would say its was probably due to exhaustion, I know when I am pushing myself I get a head down and plod type approach happening and have a limited awareness of my greater surroundings. Yes you’re probably right. The anecdote about lowering a billy out the window to collect water suggests it was located close to the river, so might not have been completely visible if the trees clustered near the edge then as they do today.